More and more people are becoming smartphone dependent. They use it for almost all work from scheduling meetings to making a to do list for home related work or office work. Looking at how things are changing it is evident that soon computers will be history. The only thing that makes them still alive is their screen size, ease of access and powerful hardware. Making presentations, doing research is not easily done on smartphone as compared to PC. But with Mirabook the future is soon going to change there will be no need for computer, smartphone will be sufficient enough to carry all the tasks. A definitive smartphone accessory that brings revolution into the world of mobile phones. Transforming your device into the only computer you need. Simple connect your phone and change it into a lightweight 13-inch notebook with a full-sized keyboard, trackpad and 24-hour battery. You can use it to play games, take notes, make presentation and more. The aluminum finish and light weight makes Mirabook an ultimate device that acts as a bridge between PC and smartphone. It comes with a display of 13.3 inch offering 1080p resolution. Also, the 24-hour battery life makes it easy to use on the go. A Type-C USB is required to connect it with smartphone and centralize all the apps at one place. It comes in 6 different colors: Midnight Black, Abyssal Blue, Fire Red, Leaf Green, Electric Yellow and Rose Quartz. Android Phone: There are many apps around that can be used with Android to provide desktop interface like Oxi App, Sentio Desktop, Leena OS. 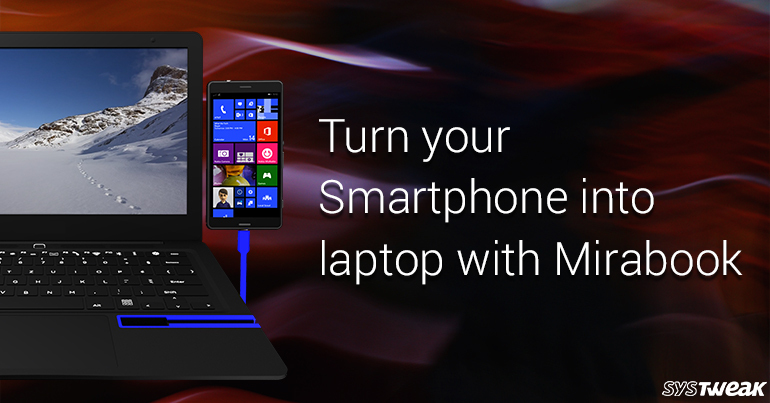 Windows Phone: are plug and play solution with the Mirabook. Windows Continuum allows you to enjoy true desktop with applications like Microsoft, Word, Excel, Powerpoint and others. Raspberry Pi: A special board extension is designed for raspberry pi. It mixes a USB-C port with DisplayPort support to work with Mirabook. Computer Stick: There are many compatible sticks but if yours doesn’t work install DisplayLink and OS on it e.g. MEeGoPad sticks. What Android Phone Are Compatible With Mirabook ? A device using USB type C and DisplayPort are compatible with Mirabook. Note: Mirabook is not compatible with Apple devices. Mirabook simplifies your digital life, instead of having limited interface now get a larger screen to work on. You can perform any task on it from doing a research to making presentation anything can be done, all at one place. Plus, play millions of games available on Android and Windows it will be available In May for 249 $ product for the future one device that is every device.